PITTSBURGH—University of Pittsburgh student Emily Crabb has been named a 2014 Barry M. Goldwater Scholarship winner for her outstanding undergraduate research in engineering and her commitment to pursuing a career in science. 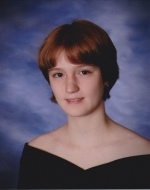 A native of Royersford, Pa., in her third year of study at Pitt, Crabb is majoring in computer engineering in the Swanson School of Engineering and majoring in physics in the Kenneth P. Dietrich School of Arts and Sciences. In addition, three Pitt students have received Honorable Mention designations in the national 2014 Goldwater Scholarship competition: Andrew Abboud, a junior from Troy, Ohio, majoring in biological sciences and religious studies; Angela Beck, a junior from Monongahela, Pa., majoring in bioengineering; and Alexandre Gauthier, a junior from Charlotte, N.C, majoring in physics. Since her freshman year at Pitt, Crabb has conducted research within the laboratory of Anna Balazs, a Distinguished Professor of Chemical Engineering and the Robert Von der Luft Professor in the Swanson School. Crabb’s research interests include studying the physics of nanoscopic and microscopic systems. In 2013, she coauthored the academic papers “Harnessing Fluid-driven Vesicles to Pick Up and Drop Off Janus Particles” and “Self-healing Vesicles Deposit Lipid-coated Janus Particles into Nanoscopic Trenches,” which were published in the journals ACS Nano and Langmuir, respectively. Crabb also presented her research findings on the behavior of lipid vesicles in solution at the 2013 American Physical Society conference. This semester, Crabb is studying computer engineering abroad at the École Nationale Supérieure de l'Électronique et de ses Applications in Cergy, France. After graduating from Pitt, Crabb plans to earn a PhD degree in physics and pursue a career conducting theoretical physics research as well as international collaborative research.